Peter Stöger returning to Köln and Michy Batshuayi making his debut for BVB were the main topics ahead of Köln vs Dortmund. The Belgian forward scored twice quickly ending any talk on whether he was the right man to replace Pierre-Emerick Aubameyang. Batshuayi scores twice on his debut. Peter Stöger wins upon his return to Cologne. It was lively start by both sides with neither team holding back early on, which meant that there was very little structure in the early goings of the match. In the 12th minute, Köln should have taken the lead with Sehrou Guirassy making a tremendous forward run on the right side of the pitch his low pass inside the box found the wide open Milos Jojić, who merely had to slot the ball home, but played the ball right onto the outstretched Roman Bürki. Two minutes later Dortmund should have taken the lead. André Schürrle broke into the box on the left passed the ball on to Mahmoud Dahoud, who was brought down, but managed to toe the ball to Shinji Kagawa, while falling, his central shot from just outside the box thundered off the crossbar. The first 20 minutes of this game were breathless with end to end stuff with both teams not holding back not indicating at all that both teams have been struggling at times this season. The two teams continued their open play into the second half of the first period with both teams keeping up with their high press, which produced plenty of mistakes on either end. The result was something that has been criticised widely about football in the Bundesliga in general in recent weeks, which is a high pressing game that looks anything but tidy. It was, however, a Gegenpressing situation that produced Dortmund’s goal with Jeremy Toljan winning the ball in Köln’s half sprinting forward the left-wing and then crossing the ball into the box where newly signed Batshuayi was ready to tap in the ball in typical Pierre-Emerick Aubameyang fashion. Just before halftime, Dortmund thought they had a second with the Yellow and Blacks combining well into to the box where Toljan once again found Batshuayi, who tapped the ball home, but replays revealed that the Batman was a fraction offside and the goal was chalked off. It was a spectacular first half with Dortmund on balance deserving the early lead, given that they had produced the better chances in the first 45 minutes. The second half started off where the first half ended with more end to end stuff by both teams. Pressing high both Köln and Dortmund were looking to win the ball and quickly move forward, which left both sides exposed at times. Köln found the first big chance of the first half in the 54th minute with Guirassy winning the ball in Dortmund’s end going one-on-one with Toljan and firing off a shot that shot past the crossbar. Dortmund immediately struck back with André Schürrle breaking free on the left wing in the 56th minute and with plenty of space ahead of him he moved forward releasing a pass just outside the box that found Batshuayi and an outstretched Timo Horn had to do well to keep the Belgian forward from scoring his second. The goal could have sealed it instead Köln found the equaliser after Christian Pulisic needlessly lost the ball in Köln’s half to Dominique Heintz, and the defender stormed forward releasing a thunderous shot from the edge of the box, which was poorly cleared by Bürki allowing Simon Zoller to score the rebound. Dortmund, however, were only shocked for a moment, a long ball finds the head of Christian Pulisic, who extended the ball into Batshuayi’s run, breaking into the box the Belgian put the ball past an outstretched Horn to make it 2-1 on 62 minutes. There were more goals in this game though. In the 70th minute, Köln had the equaliser again. This time the goal came after a fantastic Jonas Hector corner that found the head of Portuguese defender Jorge Meré and his header beat Bürki, who perhaps should have come off his line to clear the ball. The way the game was going the 2-2 did not feel like it would be the result and indeed both teams continued to look for additional goals. In the 75th minute, a Schürrle cross found Batshuayi, who was left unmarked in the box, but his header was directly placed in the arms of Timo Horn. Both teams looked to find a winner, and in the 84th minute it looked like Schürrle, who was excellent throughout the game, had it. 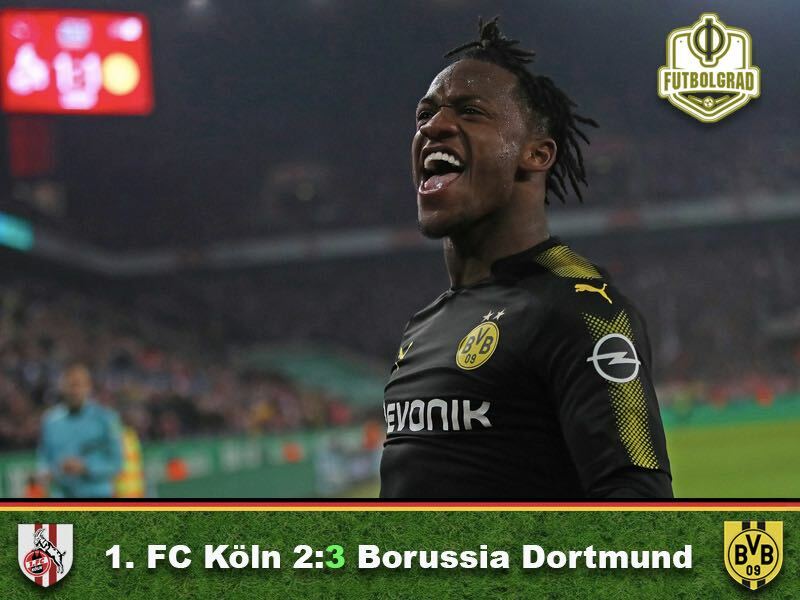 It all started with Jadon Sancho winning the ball in his half and finding Batshuayi at the centre circle, who in turn found a sprinting Schürrle on the right wing and national team forward rushed forward releasing a shot inside the box that after a slight deflection beat Bürki to make it 2-3. But there was more action with Köln pressing, and Marco Höger appeared to have another equaliser in the 86th, but Sokratis jumped into his shot with a diving header redirecting the ball over the crossbar. Moments later Dortmund were a man down with Jadon Sancho having to go off with an injury and with three substitutions made Dortmund had to hold on to fight off Köln, and the Yellow and Blacks did just that to collect all three points. All the pressure was on the new signing Michy Batshuayi to replace the void left by enigmatic goalscorer Pierre-Emerick Aubameyang. The 24-year-old could have faltered under pressure, but instead came up with a fantastic performance scoring two goals on his debut. The Belgian was at the centre of every attack and was always in the right place to be ready to cap of any attack by Borussia Dortmund. At this rate do not be surprised if the Batman finishes the season in the double figures scoring. The focus was all on Peter Stöger returning to Köln for the first time since leaving the club in the fall of 2017 and Batshuayi making his debut for Borussia Dortmund. With those two storylines dominating proceedings BVB could have been excused for letting the focus on the game drop. But the squad got down to business and although Köln managed to equalise twice the Yellow and Blacks managed to walk away with a famous win that could kickstart the second half of the Bundesliga campaign. 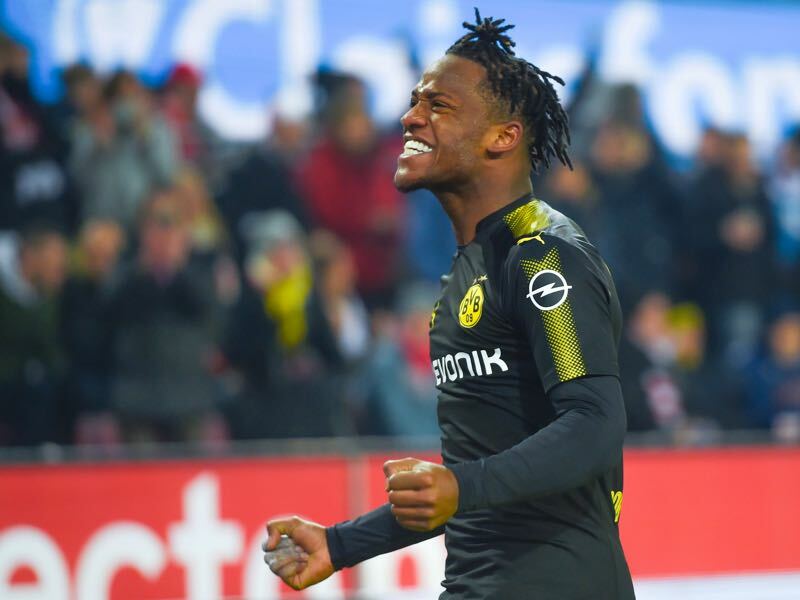 Batshuayi is the first player to score multiple goals on his debut in the Bundesliga since Pierre-Emerick Aubameyang in August 2013. Batshuayi first goal was the 500th goal of the season in the Bundesliga. Dortmund collect their first win in three Bundesliga games.